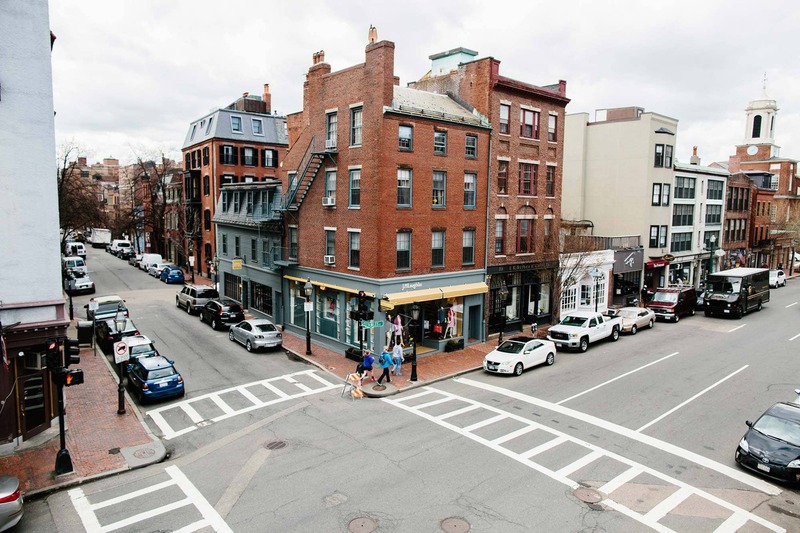 Charles Street is Beacon Hill’s bustling boutique center, where every shop invites you in to see how shopping for clothes, getting a haircut, or grabbing a cup of coffee can be an afternoon experience rather than an errand. The four blocks between Longfellow Bridge and the Beacon Hill Hotel and Bistro in Boston house seventeen restaurants and bars, fifteen clothing boutiques, ten beauty salons, a gourmet grocer, a chocolatier, and speciality nut store. Charles Street’s advantage over Newbury is it compact historical setting. The eclectic brick neighborhood encourages local and international artisans to choose charming Beacon Hill for their stories. Ouimillie is the place to go if you’re looking for fun colors and funky textures – like their pieces in yellow velvet, purple lace, and red leather. For more stylish basics, Paridaez is the store for you. Designer Allison Deroie has created pieces that can be converted from dresses to scarves or even worn backwards for a different look – making the most out of every clothing item. Do you love local designers? Head over to Holiday where Damon’s talented team showcases their signature “Pretty Little Thing” collection alongside fashionable pieces from around the world. This unique local store stocks their two Charles Street shops with clothes and home goods from small merchants, both local and international, that handcraft their items to make every piece unique. Charles Street also has lots of places for you to pamper yourself! Head to Core de Vie for guided stretches and a massage. Then try out Pinckney Nails – a neighborhood favorite for a manicure. Head over to Townhouse Beauty Bar for a stylish new haircut! Make sure you check out Follain for makeup, skin care, and bath products to keep your treat-yourself day going for weeks to come. Shopping days would be incomplete without the short breaks for snacks, coffee, and wine! So while you’re between the perfect dress and your favorite new sunglasses, stop into Tatte on the corner of Mt. Vernon Street for a croissant and a cappuccino. You’ll quickly discover why Bostonians love our local coffeehouse and bakery. For a healthier option, check out Pressed for fresh juices and snacks! If you want to go straight for the sweets, head to Beacon Hill Chocolates for rows and rows of tasty indulgences in an ornate and classic chocolate shop. Sweet Bakery also offers new cupcake flavors every day, so give them a chance to wow you with a cupcake you’ve never tasted before! And of course, celebrate your hard day’s work with a glass of wine back at any of these great neighborhood establishments. Don’t forget to stop by our sister hotel at 25 Charles Street for a refreshing post-shopping drink and meal! We hope this list gives you a few idea for your next Beacon Hill adventure. Regardless of the shops you choose to explore, a Charles Street shopping trip is immeasurably special.